Where can I look for a website that has details to make lampwork bead designs? I am a beginner at lampworking and would like to view other lampworkers bead designs which come along with instructions as to how they make their bead designs. Melting glass for sculptures (lampworking)? Does anyone know if general bottles like beer/wine bottles can be used for melting and be used to make glass ornaments? Yes, if you are used to working soft glass. Normally the bottle glass would be broken or cut in narrow pieces so the glass will fit in the flame for preheating and heating without having cold parts to shatter. However, if you were planning on using more than one color of bottle, you will probably run into the problem of compatibility – glass sold for lampworking (or fusing) is supplied with matching COE’s like 96 or 103 and there is no guarantee that two bottles have Expansions that will work together – you might find that on cooling they split or show breaks inside the glass. Best kiln for PMC and dichroic fused glass? I want to make PMC and glass pendants I don’t want to use a torch. I love lampworking but I have kids and I don”t have a studio. I learned to blow glass years ago but I never learned how to fuse glass. Do you fuse in a kiln? And if so what is the best kiln for beads? The best kiln for beads and small PMC work is probably a Paragon kiln. There is the blue bird which is quite small, but there is a slightly larger SC2 with an option of having a bead door if you want to anneal flameworked glass beads. The SC2 has a digital controller, and the size is the best for PMC as larger kilns have a fluctuation in temperature which sometimes results in melting of pieces. The price is about £600 and plugs into an ordinary 3 pin socket. There are many uk retailers. I think www.warm-glass.co.uk has them for sale on their website (an excellent resource for dichroic glass too). Bead Making Classes near Southampton UK? I make my own jewellery and would really like to take it a step further by making my own beads. It seems to be really difficult to find lampworking classes though near Southampton in Hampshire! Can anyone recommend somewhere? Try Daisy Chain Jewellery – they offer jewellery making workshops. The lovely lady who runs it, Jo, can be found at www.daisychainjewellery.co.uk. She has some connections to lampwork bead makers, and she writes for a bead or jewellery making mag! She should be able to help you, even if she doesn’t offer lampworking classes herself. 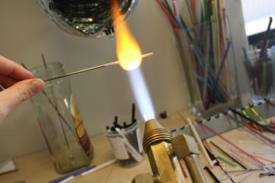 Lampworking, Glass Bead Making Lessons? I have wanted to learn to do this for many years. I love crafts and especially enjoy creating things. I think this would be a perfect hobby for me, especially since I enjoy jewelry making. However, I live in an area where there is little education available. No classes are available to me. I have been researching and watching videos on the internet and plan to visit my local library to check on videos and books, but I was wondering if anyone could recommend any helpful books or videos for a beginner that might cover all I need to know in order to begin. Thanks! I would recommend 2 things. Also do an internet search for your region and lampworkers (or lampworker OR lampworking) to find any regional guilds or societies. They may be able to point you to someone that lives reasonably close to you. Lampworking really is one of those things that is best done the first time with someone who knows what they are doing. You may be OK with books and videos, but if you can find someone that can help you out the first time, you’ll benefit a lot from it.